STOP RIGHT HERE if you haven't read the first three books in the series and don't want any spoilers! Sabine, Nash’s ex-girlfriend, is out of the halfway house and has wormed her way back into Nash’s life, trying to force Kaylee out of the picture. At any other time this wouldn’t have been an issue; however, as Kaylee and Nash's relationship has been in limbo since Kaylee discovered that Nash had been selling his memories of her for Frost, it's not so simple. Kaylee is torn between her love for Nash, the memory of his betrayal, and jealousy over his friendship with Sabine. The question now is whether she should fight for someone she no longer trusts or let him go to Sabine to find the support he needs to stay clean. I’ve been worried about this book ever since reading Vincent’s short story starring Sabine in the Kiss Me Deadly anthology! I should have had faith that Vincent wouldn't totally throw us under the bus, though. Vincent is the master of love triangle stories (as anyone who read the Shifters series can attest! 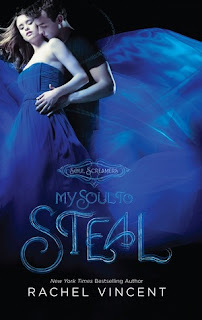 ), and that certainly shows in My Soul to Steal. While a little "high school ish" (which is appropriate, I suppose, seeing as how they are in high school), I think it's a fairly realistic situation, and it's easy to empathize with both sides. The ending was surprisingly satisfactory, considering how tense the plot was, and it's going to be a tough wait for book 5 later this year! The first three books in this series are My Soul to Take, My Soul to Save, My Soul to Keep, along with the prequel, a short story in Kiss Me Deadly, and an e-short story called "Reaper" about Tod. Rachel Vincent is also the author of the Shifters series and has a new adult series in the works.